10 Steps to Decorating a Room for $250! Every week I get an email regarding my appearance on the former Nate Berkus Show. What a fun time that was. I did so many amazing projects at rock bottoms prices it was CRAZY. 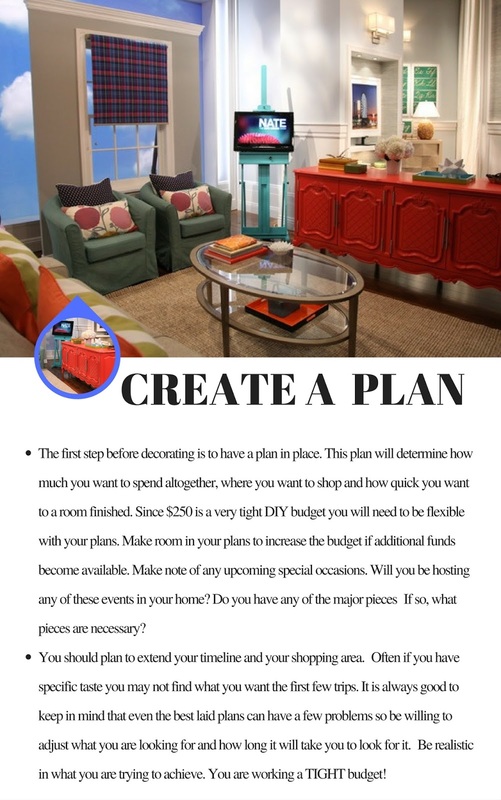 I havent done much by way of thrifting for my apartment because it is already decorated, but since I still get inquiries about many of my designs, I decided to create a 10 Step EBook Guide to decorating a room for $250 or less (or more). Honestly, I could have made this longer, but for now it is 25 pages. Why an EBook? Two reasons. Well three. First reason is that I love being creative and putting this together was a great outlet for me. The second reason is that everyone who is still around can have something to reference when they are decorating on a budget. The final reason is that I want to create a summer web series and it can get quite expensive. Although I could ask for donations (and if you feel incline to you can do that HERE), but I feel like thats begging. So to reach a lofty goal for cameras, lighting, editing assistants and all of that, I decided to at least give you something you could use. I made the EBook very reasonable at $4.99 each. Its a great resource if you have been trying to put a room together with very little money. From the many emails I get I realize I cannot decorate other people's home for a little bit of money (but if you do have money and would like my assistance you can CLICK HERE). Here is an excerpt from the EBook. This is a 25 page EBook that will get your room in tip top shape for a very little bit of money! As soon as your purchase your Ebook HERE, a link will be sent to you! I cant wait to see all of the rooms you all complete with this mini guide! CLICK HERE TO PICK UP YOUR EBOOK!